Here are the two samples I made at my first machine embroidery class. One is cut work and the other is an example of adding tassels to a design. They are not perfect, but I think I know what to do to get better results next time. I am having a little trouble figuring out where to put such a big machine. I have until Friday to decide how to rearrange and make room. I think my sewing table is sturdy enough. If not, then that will be another expense. I am really excited to try out this new way of sewing, with every aspect controlled by computer. This entry was posted on Monday, October 19th, 2009 at 3:00 am and is filed under Bernina 830 and Sewing. Tagged: Sewing. You can feed this entry. You can leave a response, or trackback from your own site. What lovely embroidery! It looks very complicated, so I think you’ve done extremely well. 🙂 Your machine is gorgeous, too. Hope you have lots and lots of fun with it. Both of them are just beautiful! 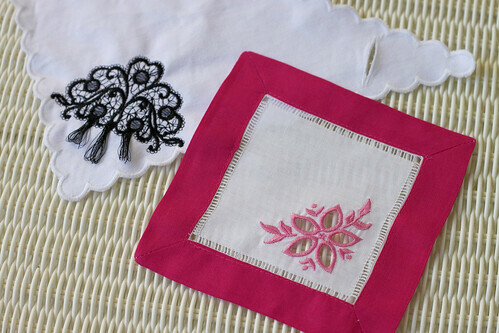 I’ve not seen much cutwork but I really love yours! I’m sure you’re totally excited about the new machine. What are you going to do first with it? Are we going to get a picture of it set up on your table?! I think I’ve been looking at too many blogs about embroidery – last night I dreamt that I was doing something with a needle and floss.